The final speaker of the day at the Tiffin Conference in Lethbridge was Melanie Mainquist of Cargill Meat Solutions in Guelph. Melanie spoke about the real beef consumer, a fictitious character named Zoe. Zoe is not unusual or weird, she is real for the majority of female consumers. She eats beef once to twice a week and is a working mother with two kids. She does not have a lot of time to cook meals. Zoe is someone that all of us can identify with because she is the beef consumer of today. As Melanie stated to me, Zoe is not someone that prepares 16 oz T-bones for the Sunday barbecue. Zoe is who the beef industry is trying to market to. Alberta Agriculture Deputy Minister, John Knapp, spoke to producers about how Alberta Agriculture is putting a strategy in place to reconnect with rural Alberta and help to enable success for members of the livestock value chain. Creating an irrigation department that focuses on improving the efficiency of water application and improving crop production in Alberta. With the use of irrigation Albertans are able to produce high value crops. Attaching a specialist to every Ag service board in the province. This will increase the two way communication so that initiatives can move forward and allow for change to happen at a faster rate. John Knapp focused most of his discussion on the Alberta Livestock Meat Strategy (ALMS) which is an integral part of bringing livestock producers back to profitability which will lead to sustainability in the sector. ALMS is the big umbrella strategy which includes Alberta Livestock Meat Agency (ALMA) and certain programs of the Alberta Financial Services Corporation (AFSC). ALMA will be the catalyst and funder to make sure the industry moves forward. John Knapp said that Alberta has to move forward by improving the cattle genome and improving barley yields by investing in feed grain research. There are also cost issues between Canada and the US. Our American friends have a $64 a head cost advantage over Canadian producers. Much of that cost is due to the slow drug registration system in Canada. Knapp said that we need to reform the time it takes to get new advantageous drugs approved in Canada in comparison to the US. The one characteristic about John Knapp that I really like is that he is very approachable and willing to at least have the discussion about what needs to change to improve agriculture in Alberta. In the couple times that I have met John Knapp, he is willing to talk to producers and not just fly in and fly out like some other politicians tend to do. The one thing that I completely agree with the Alberta Government on is that all beef industry groups and all members of the value chain need to finally work together and stop pointing fingers and work together to make sure we have a successful industry going forward. John Scott, President, Canadian Federation of Independent Grocers, spoke on the grocery market this morning in Lethbridge Alberta at the Tiffin Conference. John emphasized that grocers are trying to “be something” to the consumer. He emphasized that consumers are going to different stores to get different products. When I think my families purchasing habits we buy different products at different stores which apparently is common. Rarely do we purchase all of our food products at the same retail point. John also stated that large grocery chains are not grocery stores but are health and wellness stores now. There is a focus on health and wellness for people 18-33 year olds. If you are marketing a food product, you need to be willing to ensure that your products fits the trend towards health a wellness. To me this explains the recent trend of full service counters with chefs and nutritionists behind the beef counter. John told the crowd that nutritionists in the grocery store is a fast growing market in Canada. In my mind, this is much different than the traditional butcher look and feel. Meat has been not represented well at the counter in the past. When buying meat people do not want to see a butcher dressed in a blood soaked apron. It makes you wonder why we stopped there? Why not show the slaughter of the animal right in the store? Sounds appetizing doesn’t it. John stated that, “the chain has to work together in a collaborative fashion to make sure that the beef industry is promoted effectively.” He stated that, “it is not the sole responsibility of one member of the chain.” I agree with John that expecting government to carry this role is wrong. The industry has to lead the charge, but as we all know getting the whole value chain on the same page is quite difficult and easier said than done. Scott also mentioned that buying local is not going away. The consumer’s environmental sustainability focus will not be changed by the current recession. The”echo” consumers are pushing things like buying local that is changing the way beef and all food is marketed. I thinks that John’s message of health and wellness is right on. This is one mistake the beef business has made in trying to market 16oz steaks to today’s consumer. The beef industry must continue to adjust and promote the healthy characteristics of beef and try to break the negative perceptions that are prevalent in the marketplace. When I took economics in University, one of the concepts that I was taught was economies of scale. This concept is defined as obtaining cost advantages that a business obtains due to expansion. In farming there is a constant thirst by farmers to add land or head space to their operation. It is quite common for fellow farmers to judge success by the size of the operation and not profitability. Of course this makes sense because profitability is not a public figure due to the fact most farms are private enterprises. As your farm grows larger the potential rises for lower costs of inputs, better interest rates and increased commodity market access. 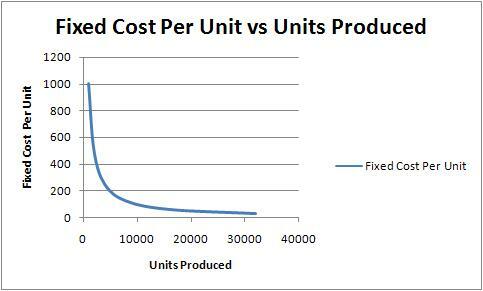 Another benefit of improved economies of scale is the lower of your fixed costs per units produced. A great example of this is spreading your office expenses (overhead) over more acres farmed provided that you keep your office expenses flat. Finding staff–For the past five years, finding staff has been terribly difficult. On top of this there has been high rates of turnover as it has become trendy to look for the greener grass all the time. Managing staff–When you are working for yourself it is easy to justify that you need to work a little harder or longer hours to get the job done. When you are dealing with employees you must manage the balance of their personal life and the jobs at hand. This is not as easy as one would suspect because not all employees view the company’s objectives as their own and may have different values or personal goals. Handling the change in role–As farms get larger the owner must begin to make choices as to what is the best use of his or her time. This is a challenge for any business owner as the business succeeds. Being the entrepreneur is a much different role than the manager. Competing with smaller operations head to head–Larger operations have larger overhead costs than in comparison to smaller operations. The larger operation is fighting to survive on volume and thinner margins against a low overhead, smaller operation. To make this clearer think of bidding on custom feeding. Don’t get me wrong the trend of larger farms is not going to slow and it does happen for a reason as equipment gets gets more productive and the quest for economies of scale are present. Like any other business you need to understand that as your farm grows the role that you may play as the farm owner is going to change and challenges will always be there. Bigger does not mean better for everyone. All of us have opinions on where canola prices are going in the future. We are all more experts in what has happened in the past rather than where the future is leading. Sometimes you need to talk to someone that knows what they are talking about and has the facts to back it up. Thomas Mielke, Executive Director of Oil World and is one of the world’s most respected oilseed crop analysts. 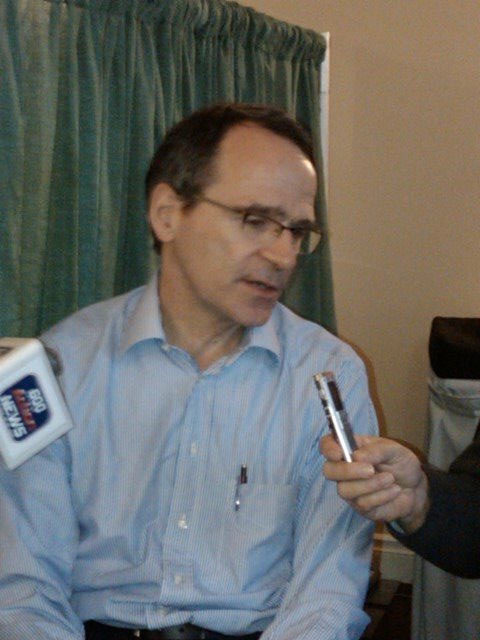 I was given the fortunate opportunity to participate in an interview with him before his keynote address at the Crop Production Week in Saskatoon. Mielke spoke about the supply and demand issues facing the soybean and canola market in 2009. Due to the fact that the Ukraine and Australia have finished their exports, Canada has a great opportunity to export 1.7 to 2.0 million tonnes of canola to China this year. Mielke stated, “that China has better crops but import requirements are increasing due to the fact the country wants to increase its stocks strategically.” Mielke is concerned that Canadian farmers expecting much higher prices are not being realistic and should be willing to take advantage of the recent rebound in price relative to the lows. I think that if you are going to listen to anyone you should listen to Thomas Mielke. I am not saying that he has been 100% of the time but the reality is that he firmly understands the fundamentals and has the data to back up his opinion. Take heed to the advice of taking advantage of the latest bump in price off the low to not be left in the cold should the price fall back again due to demand issues in 2009. This is my first time to Crop Week in Saskatoon and I plan to return in the future. One thing that is consistent amongst farm shows is the ever present beer gardens. Now don’t get me wrong there is serious business that is done over a cold one. There is discussion about Roughriders football, who will win the Stanley Cup and who will win American Idol this season. 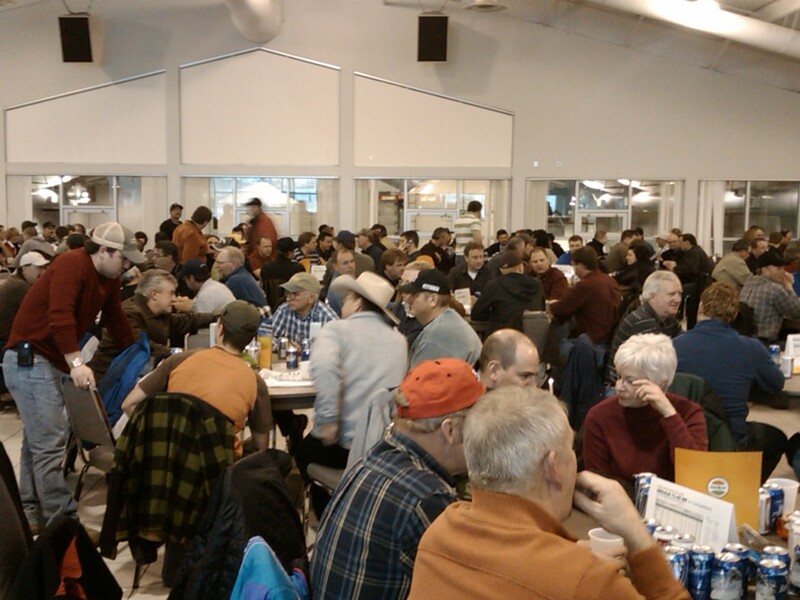 In all seriousness the beer gardens at any farm show is where farmers get to spend some valuable time together and collaborate and share ideas with neighbors or farmers from other provinces. Yesterday I went into the beer gardens and ran into and old friend, Mark Lepp from FarmLink Solutions and we had a chance to catch up and discuss what was happening in the markets. To me this type of surprise encounter is what makes farm trade shows so special. Its not just about the new equipment, new seed genetics or getting a bag of collected free goodies. A big benefit of attending farm shows is that you get a chance to connect with your network. It is important that you take the time to develop a center of influence and learn form the successes and mistakes of your colleagues. I find that grain farmers are very good about sharing ideas regarding production practices. I recommend if you have not done so yet this year attend a farm show. Manitoba Ag Days, Ag-Expo and FarmTech are all left before spring. Walk the show to do your business but also take the time to network with your network even if it is over a cold beer in the beer gardens. You are currently browsing the Realagriculture's Blog blog archives for January, 2009.